Though the theme of this website is devoted to a larger use of this property than solely as a single family residence, it is a landmark property with cozy features and warm qualities expected of a single family home. Estate-sized, however, it has been designed to accommodate the needs of extended-family living with features like a centrally located designer elevator, not some blocky thing hidden away, steam baths and sauna critical to ease of living and the health of select family members. Should you have interest in a larger use as follows, all the better. This unique property has broad appeal to both persons and organizations in need or want of a sequestered resort-oriented residence for mixed personal and business use. The Hacienda Heights Estate (1) Whatever your Order or Affiliation, League, Fellowship or Brotherhood, Organization or Business and (2) Whether it be of a Business, Personal, Philosophical or Spiritual nature and (3) If you are central to its organization or function and (4) Need a figure-head property oriented to group meetings, gatherings, social events, worship, retreat or conference of any type and (5) You need parking accommodating many dozens or, even, hundreds of visitors and (6) Need multiple gathering places, galleries, a grand media presentation room and a welcoming multi-cultural presence, then (7) The Hacienda Heights Estate, centrally located in southern California, is the most outstanding, if not only, hilltop property that can meet your needs. The Grand Entry / Central to all spiritual foundation-facilities like Cathedrals, Mosques, Synagogues, Temples and Shrines; and central to all sectarian foundation-facilities like government edifices, the US Capital Building for example, or the White House, Federal buildings and Court Houses is one defining element setting all apart from virtually every other structure or building: their grand entry and cathedral-door. I call the grand entry to The Hacienda Heights Estate the five-million dollar door. Whether the door, itself, actually cost that or not is irrelevant, because whatever it cost to manufacture, deliver by semi-truck, and install by crane is only part and parcel to the house that had to be built to accommodate the magnificent work of art that it is. First impressions are everything. Estate guests, your guests and visitors, will be awed by it in similar fashion to all that visit buildings of similar substance like, maybe, the White House, Windsor Castle or the Vatican. This is a must see and must have to lift, inspire, and lead conference guests for whatever purpose of high-cause or function you seek. Guest Parking / Essential to any business accommodating people is ample parking. With it a business can succeed, without it, it will likely fail. It’s not common, maybe, for most home buyers to consider visitor parking when buying a home; in spite of that, I see the buyer of this property to be a buyer strongly focused on that need because the highest-and-best use of this property, along with its high-end residence quality and appeal, is its social, worship and business conference potential and orientation. Inside the securely-gated resident compound there is ample parking for up to a dozen cars not counting the four-car garage. Just below the compound, but still on the lot itself is a privately owned parking lot for up to a couple dozen cars or more. In addition to this, the long curbed-drive up to the property from the gated-entry below provides ample valet-oriented parking for special occasions. Guests could walk up if wanted. Location / If you were to look at southern California from a sky-high satellite, an area stretching from Coronado Island near the Mexico border to Santa Barbara, and reaching inland from coast to mountains and desert, maybe by using Google Earth, and center your search on Hacienda Heights, you would see that it is located at the virtual epicenter of all you see. What better place to own a United Nations Estate. Hacienda Heights is a CDP, a census-designated place, in Los Angeles County. It’s located in the eastern San Gabriel Valley bordering the City of Industry and West Covina to the North, Whittier to the West, La Habra Heights to the South, and Rowland Heights to the East along the Pomona Freeway (Route 60), and is predominantly a residential community. The largest Buddhist temple in North America, the Hsi Lai Temple (meaning “Coming West”), is located in Hacienda Heights and near the property. The temple encompasses fifteen acres and a floor area of 102,432 square feet. The temple’s Ming Dynasty and Qing Dynasty architecture is faithful to the traditional style of buildings, Chinese gardens and statuary of ancient Chinese monasteries. His Lai was built to serve as a spiritual and cultural center for those interested in learning Buddhism and Chinese culture. In the state senate, Hacienda Heights is located in California’s 32nd Senate District, represented by Democrat Tony Mendoza. In the California State Assembly it is located in California’s 57th Assembly District, represented by Democrat Ian Calderon. Federally, Hacienda Heights is located in California’s 39th Congressional District, represented by Republican Ed Royce. Each at the time of this writing. The Hacienda Heights Estate is an exquisite custom property situated behind a grand gated entrance to an exclusive small community of estate-sized homes in the Casa Blanca Estates. One-hundred eighty-degree views of unobstructed city lights and seasonal snow-capped mountains are a first-noticed standout feature of this property. Guests will take pause in awe of the view upon arrival before even walking to the door. The His Lai Buddhist temple can be seen nearby. The property is a true architectural gem with six bedroom suites and seven bathrooms that radiate prestige and luxury throughout. The main level features a spacious formal living room with a projector-styled theater and family room with soaring thirty-foot ceilings and detailed crown molding. In addition to these two main floor rooms, a central conference and/or music room is a central feature of main floor accommodations. An elegant formal dining room with a price included custom Onyx-marble formal dining table that lights from within is a feature admired by all. Custom chandeliers grace every room. Elevator / The Hacienda Heights Estate is equipped with a modern air-lift elevator for convenience and ease. A grand staircase to the upper level leads to a deluxe master retreat and balcony. All bedrooms offer a master-suite design with private custom designed bathrooms (three have steam baths), private balconies and custom drapery. Exquisite designer marble, Brazilian wood flooring and cozy carpet compliment the property throughout. A water-conscious desert themed landscape and hardscape surround the residence. There are several private areas and spacious patios for entertaining guests outdoors both front and back, up and down, with all the accommodations: Spacious Seating, Built-in Barbecue, Fire Pit, Fountains, Stream and Paved Walk-Around. The Hacienda Heights Estate: A grand-scale luxury residence surrounded by other multi-million dollar homes. !!! Now Selling by Auction !!! 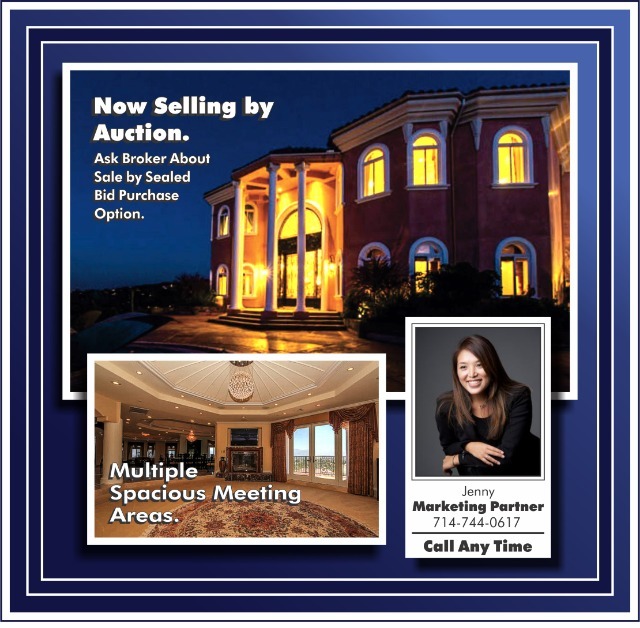 The Hacienda Heights Estate is now selling by both conventional means and by auction. This is a strong indication of a willingness by the seller to consider reasonable bids. A Sale-by-Auction Bid Form, Letter of Explanation and Instruction, and a Sealed Bid Envelope are available at the property or by email upon request. There is no minimum or maximum bid established. You can submit a bid using our exclusive non-binding bid form at any price whether "Up" or "Down" from the list price. If you are a real estate agent or a buyer working with an agent and have questions regarding this property or the bidding process, or wish to submit a bid in person, by mail, email or fax, please call any time to discuss and coordinate the process. How to See this Property. The Hacienda Heights Estate Can be Seen Most Any Time by Appointment. Success Stories / This customized website, images, story, and brochure are representative of the style and quality of online marketing we at Real Estate Professionals World Enterprise Marketing create for every property we list and sell. Some information has been removed or changed to protect the privacy of Marketing Partners and Principals. Plain Talk / Care is taken to ensure size and dimension of the site itself is compact and structured for ease of use across multiple platforms (1) Phones (2) Tablets and (3) Computers. This is largely ignored today. Even greater care is taken to avoid overselling or puffing, as it's called under law, that represents more than exists or can be delivered because the first, overselling, provides too much information and reduces previews and the second, puffing, leads to letdown and reduced sales. In advertising both The Truth Works Best and Less is More are guiding principles of paramount importance to success (1) Curiosity stimulates inquiry (2) Fulfillment reduces it. Sometimes in Real Estate Close is Not Good Enough / When market conditions are such that selling is not a challenge because of the economic climate or because of supply-and-demand relative to some region or locale, high-level professional marketing is not something people think a lot about: half-measures are adequate to the job. On the other hand, when the wheel turns and you find unexpectedly that selling is a challenge, a weak line of action will not suffice. Who decides or can decide or even knows what factors will lead to success becomes the issue of the day. Clearly, a broker with a great deal of high-level professional experience specific to the task at hand would be a good bet: one whose work and experience spans many decades and whose work and programs have done it hundreds of times, better yet, thousands of times for both home owners and new-development builders alike. That experience - Found Here - will guide every move and underscore the strategies, tactics and actions of a fast-sale marketing campaign. Al Lewis, Marketing Professional Since 1975, is the Principal of Real Estate Professionals World Enterprise Marketing, an independent, standalone advertising agency serving the needs of real estate oriented sales professionals, owners and sellers throughout home state, California, the US, and numerous International markets; and Broker of Real Estate Professionals Allstate Marketing, a real estate company licensed with the California Dept. of Real Estate, License No. 00524259. Both are headquartered in Orange County.